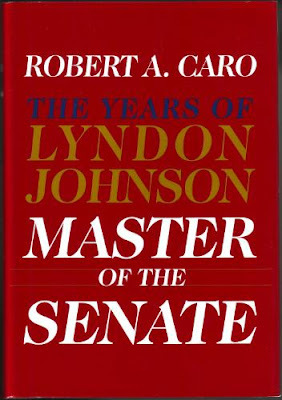 Robert Caro's masterpiece of historical biography, The Years of Lyndon Johnson, is as relevant today as it was when he began writing this epic over twenty years ago. The first volume, The Path to Power, is a political thriller of the first rank. Caro details Johnson's early life in the poverty-stricken Hill Country of Texas and his lust for recognition and popularity. Johnson's election to the House of Representatives and his subsequent first bid for a seat in the Senate are related in all their color and excitement. The second volume, Means of Ascent, chronicles the lean years when Johnson was languishing in the House and his career appeared to be heading for obscurity. This all changed when he ran again for the Senate in 1948, ekeing out an 87 vote win against former Texas governor Coke Stevenson. The legitimacy of his victory is debated to this day. The third volume, Master of the Senate (there is a fourth volume supposedly nearing completion) is the longest and most fascinating of the three. It begins with a lengthy but critical primer on the Senate itself--why it was formed the way it was and why it operates the way it does. This setup pays off when we join the titanic battle to pass the first Civil Rights bill. Johnson's political genius is on full display as he grovels, cajoles, bullies and threatens his way to the bill's successful passage. I recorded all three for Books On Tape over the course of nearly a decade. Inexplicably, Parts I and II have never been transferred to CD or download. This is truly unfortunate, for while the second volume is not quite as gripping as the others, Part I is indispensable reading if you are even remotely interested in American politics and Southern culture. Luckily Master of the Senate is still available on Audible. I highly recommend it as one of those history books that never goes out of date.